Originally built by the wealthy chancery lawyer Thomas Vernon, in the early 18th century, Hanbury Hall was the home of the Vernon family for nearly 250 years before it passed into the hands of the National Trust. Hanbury is the first of the National Trust’s properties in the West Midlands to have received a “green” make-over. Today, services such as electricity and water are brought in, but the goal is for the property to be as self-sufficient as possible, much as estates were meant to do in years past, producing meat, dairy, fruit, and vegetables for their households. Thomas Vernon and his wife Mary inherited the property near Hanbury from a bachelor uncle, but it was Thomas who was responsible for acquiring the lion’s share of the 8,000 acres he left to his cousin’s son, Bowalter. Unfortunately, Bowater turned out to be a spendthrift who managed to go through much of the fortune acquired by his predecessor. Bowater’s granddaughter Emma wed Henry Cecil, heir to the 9th Earl of Exeter, and they moved into Hanbury Hall. Unfortunately, Emma fell in love with the local church curate. When Emma confessed all to her husband, he persuaded her to break things off with the curate. But instead she ran off and escaped with her lover to Lisbon, where they were married following a scandalous divorce. Her second husband died soon, however, and Emma returned, later marrying a local lawyer. Her humiliated first husband abandoned the place for Shropshire, posing as a gentleman farmer and marrying a farmer’s daughter. Follow his death, she and her third husband managed to regain possession, but by that time, the house had been abandoned and needed extensive repairs. Following Emma’s death in 1818, Phillips remarried and had two daughters at Hanbury Hall before moving out in 1829. Probably the happiest inhabitants of Hanbury Hall were the Victorian Vernons, Sir Harry and Lady Georgina. Having never expected to inherit such wealth, they lived simply and happily, committed to each other and the local community. The last Vernon, their son, Sir George, made an unhappy marriage and ended by committing suicide in 1940, thus ending the baronetcy. Eventually, the property came into the hands of the National Trust, who manages it to this day. Built of red brick, Hanbury Hall was built in the Queen Anne style, or a “William and Mary house.” Emma’s husband Henry Cecil remodeled it, creating larger rooms and enlarging the northeast pavilion, as well as landscaping the park in the style of the times. Growing up at Burghley House, he would have contact with the famous Capability Brown. The Sitting Room was once “My Lady’s Parlour” with an attached withdrawing room. The parlour was strategically placed between the formal garden and the service quarters so that Mrs. Vernon could both entertain her guests and oversee her servants. The withdrawing room was a more private place where she could socialize with her more particular friends. With a strongly architectural appearance, the Main Hall has an air of masculine antiquity. The cantilevered staircase with its huge wall paintings by Sir James Thornhill, rises directly from one end of the hall. The aim of the wall paintings was to represent the staircase as an open-air gallery, the ceiling removed to admit the tumbling crowd of classical gods and goddesses. The Smoking Room, set at the back of the house, was a convenient location for conducting the business of overseeing the estate. Paintings of the estate and one of Bowater Vernon hunting there line the walls. The ceiling of the Dining Room is decorated with classical paintings by Sir James Thornhill, while portraits of the Vernons line the walls. Sir James Thornhill (1665/6-1734) was the only British large-scale painter of his time. His most famous work was the cupola at St. Paul’s Cathedral (1716), but in 1705, he was still taking smaller commissions such as this one. The Drawing Room takes its name from the 18th century habit of the ladies “withdrawing” from the dining room, leaving the men to discuss business and personal matters over port and tobacco. The “flying tester” bed in the Blue Bedroom is remarkably well-preserved. The worsted damask hangings date from the 1770s and have kept much of their original color since they have not been exposed to much ultraviolet light. The Gothick Corridors are named after the wallpaper. The Gothick style romanticized the history of Northern Europe and was inspired by wild nature, tending toward strong colors. The Cedar Bedroom was Lady Georgina’s bedroom. She was married to Sir Harry Vernon in 1861 (although the baronetcy came along later). The Nursery is displayed as the Victorian Vernon children would have known it. The Day Room was a room for the governess, away from the children. The Hercules Bedroom and Dressing-Room still appear as they must have in the 18th century. The windows have a superb view of the gardens. The Hercules Dressing-Room has a corner chimneypiece topped with a figure of Hercules. The Long Gallery is actually found in a separate building, probably because it was once attached to an earlier building on the site. In Thomas Vernon’s time, it was a gentleman’s study. By Bowater Vernon’s time, it had become a picture gallery. The Formal Gardens include the Sunken Parterre, the Fruit Garden, the Wilderness, the Grove, the Orangery, and the Bowling Green. In order to sustain a house like Hanbury, there had to be large areas given over to the serious production of food. “Snobs” Tunnel” led from the Walled Garden to the house, preventing the gardeners from being seen by the family when delivering produce. Behind the “polite” garden building of the Orangery lies the Mushroom House. The Victorian slate beds are still used to produce mushrooms today, as well as forcing rhubarb. There is also a 1750s Ice House, filled by ice gathered from a shallow ‘freezing pool’ on winter nights. An orchard has been largely replanted with over 136 apple trees. Beehives and chickens have also been introduced in the Walled Garden and Orchard. Within the Park there is a wealth of archaeology from the Iron Age onwards. Traces of medieval ridge and furrow cultivation still exist, and to the south lie the remains of the vanished medieval village of Moreweysend. With thanks to Heather King for being so kind as to drive Cora Lee and me to visit Hanbury Hall, along with Roxy the Quadralingual Dog! More photos of Hanbury Hall on my Pinterest board. 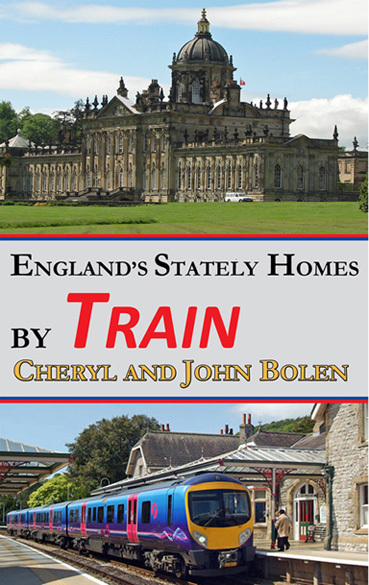 As I’ve mentioned before, I planned mine with Cheryl Bolen’s excellent book, English Stately Homes By Train. I used the print version during the planning stage and the digital version for reference while in England. 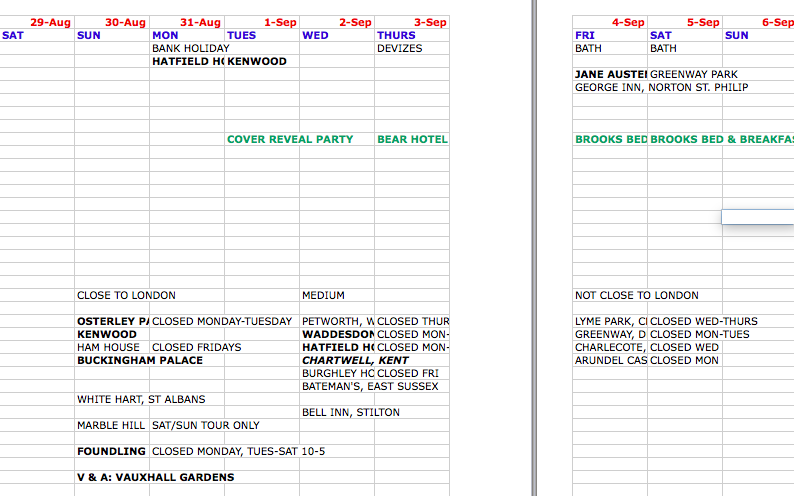 It’s always a good idea to check each location’s website before you go for updated information such as opening times. 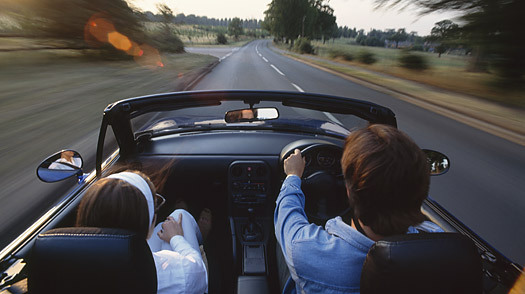 If your trip is longer than a week, consider renting a flat in a location central to the area you want to visit. London (Baker Street) is my choice, but it is pricey, so you’ll have to weigh the price against the value of convenience. On my recent trip, I spent six of my nineteen paid nights outside of London, which added to the cost, but was totally worth it, in my opinion, not to have to carry all of my luggage around with me. Of course, traveling with others and splitting the cost is a great way to economize, even if you have to find a larger flat. Mine is a studio efficiency consisting of one room, a bathroom, and a tiny kitchen. Perfect for one person or perhaps a married couple. Be sure to check for amenities before you sign the contract. My flat has satellite TV and Wifi, but no air conditioning. Last year when I was there in May and June, it was so hot I couldn’t sleep. The management finally got me a small fan, which was a great help, and I was glad to see it was still there this year. No matter how careful you are, there may be unforeseen issues. For example, last year, someone in a nearby flat was doing construction during the day. If you plan to be out most of the day, this won’t be a problem. But if you want to stay home and rest or write on a weekday, you’ll need some really good noise-canceling headphones. If I hadn’t had to use it, it would still have been worth it for the peace of mind. I’m used to traveling on my own—although this year I did have Squidgeworth with me—but I don’t like to think I might get stranded in some unknown place. The Brits I’ve met have been exceedingly friendly and helpful, but there’s always a chance I might meet up with one who is not. 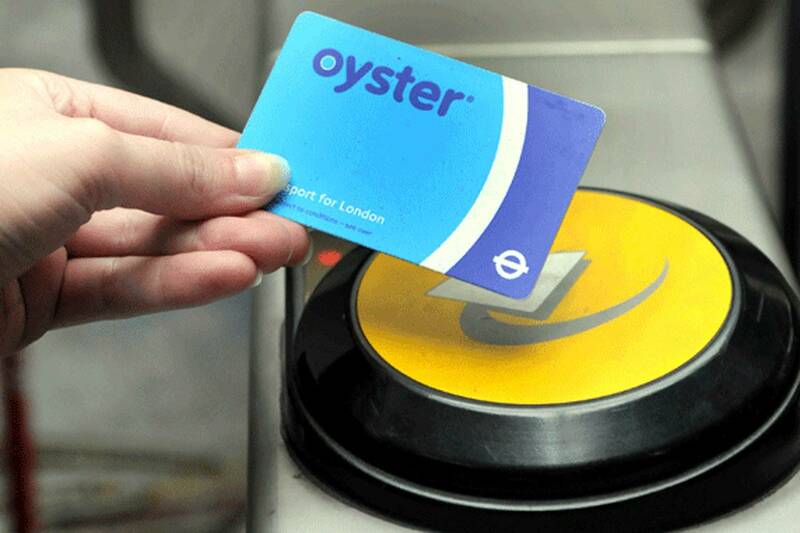 An Oyster card is an electronic card for use in the London Underground system, which includes buses and some localized trains. You can get the card upon arrival at the airport. You pay something like £5 for the card and then whatever amount you want to load onto it. I bought mine four years ago and use it every year. It’s easy to load the card from one of the machines at each Underground station. I estimate I used about £90 on mine during my three-week trip. If this is your first trip, you can purchase the London Pass, which gives you fast-track entry to many of the most popular London sights, and an Oyster card is included. Keep the Oyster card for future trips. This is a Google image. Mine did not cost this much. 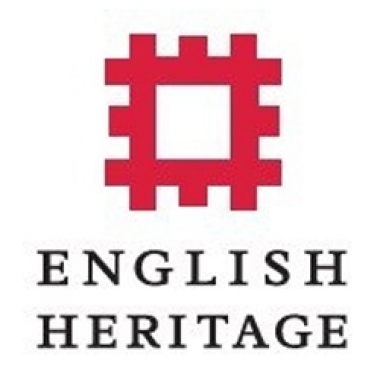 If many of the sights you wish to see are designated as English Heritage or National Trust locations, you might be able to save money by purchasing passes valid for the length of your trip. I purchased a National Trust pass from the VisitBritain Shop, but lost it. Oh well. I always feel good about supporting the efforts to maintain these wonderful-but-expensive historic buildings. It rains in England. Get over it. As much as we would all love having warm, sunny days for our long-anticipated visit, chances are it’s going to rain. Maybe it’ll just rain for a few minutes. But it might rain all day, and if you’re really unlucky, it might rain all day, every day. Don’t let it spoil your trip. Take a waterproof jacket and an umbrella and some good walking shoes that won’t be ruined by mud. You might not feel like traipsing through miles of gardens in rainy weather, but you can still see the manor house and the outbuildings (if any), and get a few photos of the grounds. At Witley Court, I took a video of the fountain in the rain (goes off every hour). Frankly, I prefer a bit of rain to 80-90-degree weather. These manor houses do not have air conditioning, so when it’s hot outside, it’s at least as hot inside. But if that’s what I get, oh well. C’est la vie. Some things are just not worth whining over. You walk to the Tube station. You walk a lot inside the Tube station. You walk from the Tube station to your destination. While at your destination, you walk. The same goes for trains. While you can take the Tube to Osterley, you still have to walk a bit to get to the grounds of Ostlerley Park, and then there is a very long driveway to get to the house. (There is a shuttle, but I didn’t encounter the shuttle until I was almost there.) In any case, you have to remember that these stately manors were built on huge estates, often set back a mile or more from the main road. If—like me—you’ve decided not to try to drive in England, you’re going to have to get used to walking. And paying for taxis for the more inaccessible places. That’s just the way it is. If you are a great walker to begin with and would like to extensively explore the grounds of the manor you are visiting, you might consider staying overnight nearby. Oftentimes the house is open only four or five hours, and the grounds a bit longer, but if you want to make thorough visits to both, you might want to plan for two days or even more. You’ll probably have to pay an extra entrance fee for an additional day, but most places have a lower fee for the grounds only. And if it’s a National Trust or English Heritage site, having the pass will save you lots if you want to visit multiple times. Last year I stayed at Leeds Castle (the Stable Courtyard) and Hever Castle (the Astor Wing), and loved being able to get up early in the morning and walk in the grounds before the gates opened to the public. I also stayed at the Devonshire Arms in Beeley the night before I went to Chatsworth. Lovely little town on the Devonshire estate. This year I stayed at the Bear Inn at Devizes, which was one of the coaching inns mentioned in my Coaching Days & Coaching Ways blog series last year. There are so many of these out-of-the-way places in England. Seek out a few and enjoy the atmosphere that comes with centuries-old buildings and towns. You won’t regret it. Did I just say that? I guess I did. The thing is, there are lots of great places to visit that might be more than a little problematic to get to without driving. At the moment, I still have quite a few to go before I get to that point. But if I do, would I forego visiting them just because I’m hesitant to drive on the left side of the road? I don’t think so. I’ll find a way to do it if I have to. Because I don’t think I’ll ever be done with visiting England’s great historical sites. But when I do get to that point, I’ll be sure to warn my English friends of my travel plans so they can stay out of my way. You probably won’t need them. Yes, you’ll need an adapter plug or two for charging up your electronic equipment, but these days most (if not all) of them are multi-voltage devices. Click here for more information. In most cases, you won’t need to take a hair dryer with you, since hotels and B&B’s usually provide them. Newer hair dryers are dual-voltage and have a switch for 110- or 220-volt electrical currents. If you need something like a curling or straightening iron, you might consider buying one in the UK to use for this and future trips. It’s a lot simpler than messing around with converters and the like. For a toothbrush, I keep a battery-operated one in my travel case, so there’s no need to recharge it.